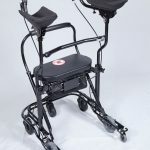 This has proved to be a very successful way to appreciate and assess the unique features of this specialised walking aid. Where possible, we will visit your Department and demonstrate the U-Step and/or LaserCane, after which, it can be left with you for the trial period. 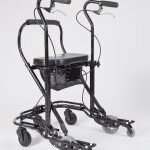 If it is not possible to arrange a demo, the U-Step will be delivered to you free of charge with instructions on use and adjustment. The U-Step can be purchased at any time during or after the trial – discounts may be available if the equipment is to be used for assessment purposes – please contact us for details. If your Department decides not to purchase the U-Step, all we ask is that you re-pack the equipment in its original packaging and we will arrange collection by our courier. Please look after the equipment whilst in your possession as you will be liable for any damage or loss of components (normal wear and tear excepted). Use the form below to arrange your free trial. Due to limited availability of loan equipment, if you just have one or two patients that you have in mind, please contact us directly to arrange personal assessments either in clinic or at the patient’s home. Any loss or damage is the responsibility of the person/organisation named above. The unit remains the absolute property of Attainability UK Ltd, unless and until it has been paid for in full. The Free Trial is not open to individuals.